There's plenty of alternative energy activity going on in the Canadian province of Ontario, including the 101 MW Chatham wind power project, which was completed earlier this year. The Canadian province of Ontario is a leader in wind energy—in fact, Ontario is the leader in Canada, with close to 2,000 MW of installed wind energy capacity. Last year was a record year for wind energy development in Ontario with the installation of 522 MW in the province. Across Ontario, encouraged by a government Feed-in-Tariff program, wind energy projects have brought direct investment, new high-value jobs, and economic growth to rural areas, as well as a new source of taxes for municipalities. According to a report by ClearSky Advisors, Ontario is expected to install more than 5,600 MW of new, clean wind energy capacity by 2018, creating 80,000 person-years of employment, attracting $16.4 billion of private investments (with more than half of that invested in the province), and contributing more than $1.1 billion of revenue to municipalities and landowners in the form of taxes and lease payments over the 20-year lifespan of these projects. Among the largest recently completed projects in Ontario is the $300 million, 101.2 MW Chatham wind power project developed by Kruger Energy, which came online in January 2011. 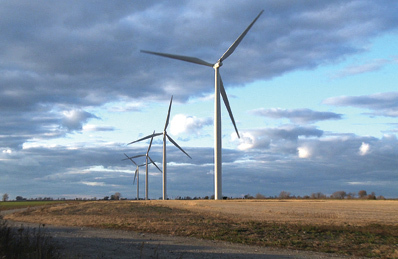 The Ontario Power Authority selected Kruger Energy's Chatham wind project through its third Request for Proposals for Renewable Energy Supply (RES III). The energy produced by the Kruger Energy Chatham wind project is being sold to the Ontario Power Authority under a 20-year supply contract. Energy for the Chatham wind power project, which has 44 Siemens 2.3 MW MKII wind turbines. The scope of work included access roads, foundations, electrical collector system, switching station, and connection to the distribution lines. This is actually the second contract the AMEC/Black & McDonald joint venture has received from Kruger Energy—the companies completed the nearby 101.2 MW Port Alma Wind Power project in 2008. The AMEC/Black & McDonald joint venture has been very active in Ontario, delivering close to 35 percent of Ontario's operational wind power capacity. As with many of the wind power projects in Ontario, the Chatham wind project is located in an agricultural area in southwestern Ontario. The site itself is fairly flat, sitting just north of Lake Erie, which borders Ontario on the north and New York State on the south. "The turbine layout for Chatham Wind is dictated by the wind regime, which is influenced by the lake," explained Mohan Kalyana, who was AMEC's project manager. "The turbines mostly run parallel to the shoreline of Lake Erie, with some of them slightly more inland." The project features two different lengths of blades on the Siemens wind turbines, reflecting the varying wind intensity of the site. A total of 40 turbines on the more robust wind sites had 101-meter length blades, and four inland turbines had 93-meter blades. All turbines had the same hub height of 80 meters. "You could generally say that the southwestern part of Ontario, which is south of Lake Huron and north of Lake Erie, is a sweet spot for wind," says Kalyana. "The prevailing winds come out of the southwest, right off Lake Erie." The project developer and owner, Kruger Energy, is a subsidiary of a major forest company, Kruger Inc., which has diversified into wind, biomass, and hydro power in recent years. Kruger Energy was responsible for the relationship with the landowners in the area and kept landowners and residents up to speed with public meetings and a regularly updated project website. AMEC was involved with the project before construction, doing the preliminary engineering work and supporting information for Kruger Energy for the inter-connection assessment and the environmental assessment. "We also had meetings with the landowners and Kruger Energy before the start of construction on the project to explain what was going to be involved and talk about safety and the dangers of heavy equipment moving around the site," said Kalyana. "Plus, before we entered each property to build the roads or do foundation work, we met with the landowner to explain what we were doing." He reports that they received good feedback from the owners on their approach, which was important to them on a professional basis and also important to Kruger Energy. "We put a heavy emphasis on that because we know that Kruger Energy is going to be dealing with the landowners for the next 20 years, so it's important that the landowners come out of the construction process with a positive impression of how things were handled with the project." The knowledge base of local residents and landowners illustrates just how common wind power is becoming in Ontario, especially in this part of the province. "With the earlier projects we've done, there was a lot of education about what a wind power project involves. But there have been a number of projects in this area, and the farmers have seen the other Kruger Energy project, so they know pretty much what to expect and what the end result will be." They also worked closely with the local municipality and other authorities for the necessary construction permits and the electrical inspection approvals. The actual interconnection contract is between Kruger Energy and the Ontario Power Authority. As noted, the Chatham wind project contract was a joint venture between AMEC and Black & McDonald. "We jointly take on projects, with firm schedules for completion and quality," explains Kalyana. "We are totally responsible for the Balance of Plant scope of work except for the turbine supply and erection in this project, which is a separate contract between the turbine supplier and the owner. "Generally, AMEC does project management, scheduling, and the detailed engineering and Black & McDonald is the on-site construction manager, responsible for areas such as safety and bulk material ordering. But we work together very closely and share the profits, but also share the responsibility." It is, says Kalyana, a good meshing of the skillsets of the two different companies. "It's proven to be a good concept—we work well as a team." The two companies have been involved in about a dozen projects, going back 20 years. They've been working on wind projects for the last 10 years. Kalyana says one of the keys to the construction of a successful wind power project is safety. "Especially if you have a project that covers a large area of land." The Chatham project covers about 25,000 acres. "We have everyone on site registered at the project site office and with the safety officer, so they know where they need to go or they are escorted there." Safety is part of the culture at both AMEC and Black & McDonald, and never compromising on safety is one of AMEC's core values. There is a mindset where no injury or incident is acceptable. "Safety is everyone's number one priority and that extends right up to the senior management team." Illustrating just how serious they are about safety, the responsibility for safety rotates monthly among AMEC's senior executives. Client meetings and planning meetings were held weekly to share information and keep the project on track. The discussions included what they would be doing for the next week, and the information was conveyed to landowners and local government officials. There were also smaller scale daily meetings, when they discussed a particular significant activity going on that day. As with all major projects—perhaps especially wind projects—activities can change from day to day, depending on variables such as component deliveries and weather. "These challenges, especially weather, can happen at any time," says Kalyana. "In Canada, we have an extremely cold winter season, followed by spring and summer seasons when there is a huge amount of construction, followed by a rainy season. "We know what to expect, and we work with that. But we also have back-up plans for critical activities like turbine erection or building roads or drain crossings that might be impacted by the weather. We have a bit of a cushion for anything that we come across." In the case of the Chatham wind project, the contract was signed in October, and the engineering was done in November and December. "By the time we mobilized things to the site, it was December, and the ground was frozen. So the only things we could do were the drain crossings." Because the land in this area of Ontario is very flat, preventing natural drainage, there is an extensive drain tile system. In some areas, there are drain tiles every 16 to 20 feet. AMEC, the international engineering and project management company, and its 50/50 joint venture partner, Black & McDonald, were awarded the engineering, procurement and construction contract by Kruger Energy for the Chatham wind power project, which has 44 Siemens 2.3 MW MKII wind turbines. "That created a challenge when we were building roads and installing underground cable because every time we cut a tile, it had to be repaired," explained Kalyana. "In some cases, when the tiles were close to the surface we had to replace all of the tiles." For the landowners, the drainage tile system is the key to their farming livelihood. "We prepared the tiles, took down GPS coordinates, took photos, and showed them to the farmers to make sure they were happy before we did anything." There were also challenges getting material to the site. They faced load restrictions that limited what could be hauled during the spring. "This restriction put a lot of strain on our schedule in terms of starting the actual construction at the end of April. The turbine parts started arriving in June, so we had to finish all the foundation work and access roads before that, so we only had about 2 ½ months to do the civil construction." They were resourceful when it came to road construction, taking a bit of a different approach. "We changed the road construction method from a conventional granular/stone road to a cement stabilization method," said Kalyana. "The process involves mixing the sub-base of the road with Portland cement and then rolling it to get the required strength. It performed much better than conventional road, and we were able to finish 30 kilometers of road in about 30 days—we saved about 2 ½ months on that alone." Another advantage with this road system is that they were able to use far less aggregate—they used native soil, except for a small layer of stone on top. "This method has never been used in Ontario with this kind of soil. It's been used for airport runways, but to our knowledge, it has not been used before on wind projects." Typically, foundation excavations have a 45-degree angle on the side because they need to go down three meters. "We used step cutting and reduced the depth of drop, so we were able to reduce the overall excavation volume." This took a fair bit of time pressure off the project. 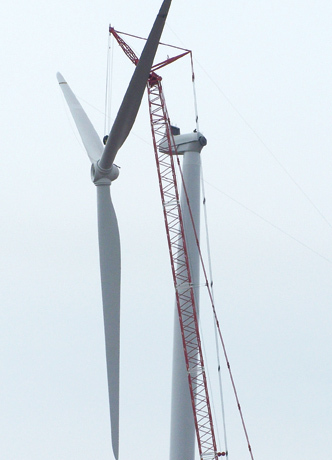 Once they got into summer, it was full speed ahead on the turbine erection. 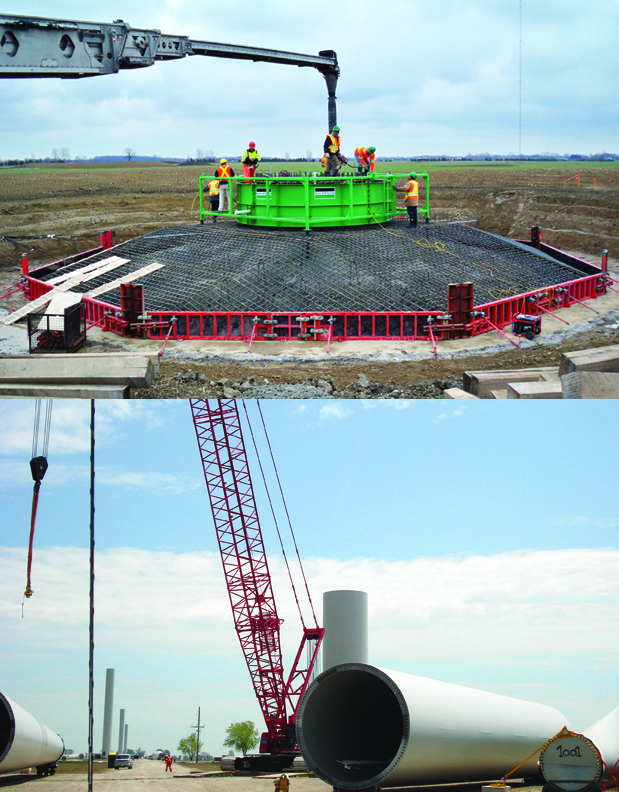 Kruger Energy oversaw the environmental assessment for the Chatham wind project, but AMEC did the geotechnical work. Once they had all the approvals, they created an overall Construction Environmental Protection Plan. "It dealt with all the issues," said Kalyana. "We had some special breeds of snakes in some locations, so we had to make sure we did not disturb their habitats, and we had biologists monitoring these areas." There were Class Four shrubs that had to be protected, so roads were re-routed and turbine foundations re-sited. In addition to the work it has done in Canada, AMEC has also done a fair bit of design work and environmental work on wind projects in the U.S., which it's looking to do more of, as well as taking on construction work with wind power projects. As part of the company's Vision 2015 strategy, AMEC wants to extend their geographic footprint, notably with wind, solar, and biomass projects.